A simple proposition to harmonise at the EU level a copyright exception for the use of pictures, footage or painting of works (buildings, sculptures etc.) in public places triggered an unexpected controversy. The exception, called Freedom of Panorama, was under attack, an amendment threatening its existence. In the majority of EU countries with this exception, photographers, artists and filmmakers feared they would no longer be able to take and publish photographs or footage taken from public ground. The fight pitted MEPs against one another, highlighted schisms among political allies and ended up mobilising the Internet’s sixth largest website as well as hundreds of thousands of voices online. But all started when a Pirate’s word was turned on its head. On June 16, the Legal Affairs (JURI) committee of the European Parliament adopted a report evaluating copyright reform in the EU, drafted by German MEP Julia Reda. Reda, the lone Pirate Party MEP of the European Parliament, had been appointed rapporteur of the report back in 2014 . If, for her, the passing of the report was a “ turning point in the copyright debate ,” she sounded the alarm on Freedom of Panorama. She suggested Freedom of Panorama, defined by her as “the right to publish pictures of public buildings and artworks such as sculptures permanently installed in public places,” even for commercial purposes, should become the law in the EU. This copyright exception is already the law of the land in a majority of European countries, to some extent as a few forbid commercial use. In the EU, only Belgium, France, Italy, Luxemburg and, depending on who you ask, Greece have not implemented any sort of exception. But the JURI committe “turned this proposal on its head, by adopting the most restrictive amendment on the question,“Reda wrote. The adopted amendment now states “Considers that the commercial use of photographs, video footage or other images of works which are permanently located in physical public places should always be subject to prior authorisation from the authors or any proxy acting for them;”. “That the amendment was adopted reflects less a concerted attack on the Freedom of Panorama than an outdated view of copyright issues and a sometimes misguided overeagerness to ‘protect artists’ prevalent among many MEPs” a Reda collaborator told euronews. Cavada’s criticisms were dismissed.“To call Wikipedia a ‘US monopoly’, lump them together with profit-driven companies and suggest that this global collaborative project to make knowledge accessible to all is somehow acting to the detriment of European culture reveals a staggering out-of-touchness with the information age on Mr. Cavada’s part,” the Reda collaborator said in an email. Since putting up the petition, Trinkhaus told euronews in an email interview he receives between 10 to 15 emails a day, media requests and support messages from all over Europe. Pro-Freedom of Panorama netizens have also volunteered to translate the exemplary email destined to MEPs in 10 different languages. Risk of “permission hell” ? Among those who are getting the word out on the issue online is Londoner James Heald, who has been particularly active under the #saveFOP hashtag on Twitter. What pushed him to be so vocal on social media are “three things really,”: freedom, access to knowledge and the proper balance for copyright law. “Part of the essence of public sculpture and public architecture is the dialogue between the work and the surroundings and the people who experience it — and that dialogue is so much stronger when anyone can publish what they want, without having to worry about copyright or clearance,” Heald told euronews. Ahead of the JURI committee’s decision, he even bought and mailed two books on the stories and histories of the statues and monuments of London to his local MEP, Labour’s Mary Honeyball. Honeyball happened to be the shadow rapporteur for the left-leaning Socialists and Democrats group at the European Parliament. Despite the efforts of Heald and others, Cavada’s amendment, named paragraph 46, was adopted on June 16 by the JURI committee, with the help of conservative EPP and centre-left S&D votes. MEP Honeyball did not answer euronews’ questions despite repeated attempts. A self-admitted lousy photographer, Heald occasionally contributes texts and photos to Wikipedia, where parts of the pro-Freedom of Panorama movement originate from. Alarmist banners on Wikipedia, the Internet’s sixth largest website, dramatically boosted the issue’s publicity. On July 3, Wikipedia co-founder and public face of the online encyclopedia Jimmy Wales himself urged Brits to mobilise and sign the petition in a Guardian’s Comment is Free column. “The ‘reform’ would have terrible consequences for the way we share and create culture and knowledge. The UK creative industry, recognised as one of the most vibrant in the world, would be encumbered with interminable bureaucracy” Wales wrote. While hundreds of thousand were voicing their opposition to the restricting amendment online, MEPs, including political allies of the shadow rapporteur, turned against the amendment. MEP Jean-Marie Cavada’s “concerns have to be read within the situation of copyright in France,” a press officer for the liberal ALDE group told euronews. But on the EU level, because of the changes it would impose on member states, Cavada’s amendment “causes major controversy,” the spokesperson said. The opposition was mounting. 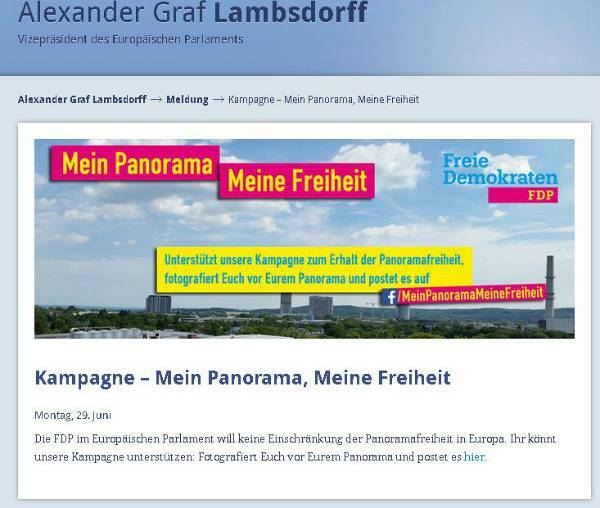 German liberal party FPD, despite being an ALDE member, launched the Mein Panorama, Meine Freiheit campaign to defend Freedom of Panorama. “One should not need to consult a lawyer before posting something on the Internet,” Dita told euronews. The diverging views inside ALDE are perhaps best embodied by a new amendment tabled on July 1 by Dutch ALDEMEP Marietje Schaake, despite a inter-groups agreement not to table any new text. Her amendment calls to revert Cavada’s, to recognise the right to use photographs, video footage or other images of works which are permanently located in public places; , which was Julia Reda’s initial position. At noon on July 2, Cavada sent out an email to all his MEP colleagues. He called Schaake’s amendment “extremely harmful to the equilibrium we finally reached after months of negotiations” and asked MEPs to defeat it. But, as the rapporteurs had agreed to have separate votes – that is votes on whether to delete parts of the report, he asked his colleagues to vote against the very own Freedom of Panorama amendment he tabled. “This is the reason we called to vote against Paragraph 46. Since Julia Reda’s initial proposition was deleted in the JURI committee, there is no need to counterbalance it anymore.” The office of Cavada also assured euronews he took the decision autonomously, without pressure from the ALDE. “We cannot deny there is been some tension during the last weeks between some ALDE members,” the ALDE spokesperson admitted, “but things are getting better.” Several ALDEMEPs contacted by euronews agree. They appreciate Cavada’s position to urge his colleagues to kill his amendment. However, ALDEMEP Charanzová told euronews she supports Schaake’s amendment. “As one of 40 members who co-signed it, I think Panorama photos should be in the public domain in most cases.” Reda also supports the amendment, although she did not co-signed it. They can vote for the restrictive Paragraph 46, despite calls to kill it. They can vote to delete the now infamous amendment, “to delete any reference to this issue as already during the negotiations it had been impossible to find a compromise on these extremely diverging systems” according to an ALDE spokesperson. Concerning the new amendment table by Schaake, despite being backed by Reda and 40 other MEPs, it may prove dead on arrival. Press officers for the conservative EPP and centre-left S&D groups, by far the two largest in the EP, have told euronews their MEPs will vote for the deletion of the paragraph on panorama, as requested by Cavada. On July 3, the debate online and among MEPs heated, EU Commissioner for Digital Economy and Society Günther Oettinger reacted. After all, MEP Reda’s report is an Own Initiative Report (INI). Described on the EP website as an “important tool in the early phase of the legislative cycle trying to shape the agenda,” the European Commission ultimately chooses whether it wants to follow such reports, supposed to represent the Parliament’s view. To back their statements, the two EU officials refer to the article 5(3)(h) of the Infosoc Directive which allows users to reproduce and make available online “works, such as works of architecture or sculpture, made to be located permanently in public places;” a wording so broad some members states have understood it to mean art works inside public museums or, in the case of Greece, to limit the exception to mass media. The imminent threat on Freedom of Panorama appears to be lifted. “It’s very good to see that the EU commission makes a clear statement against restricting the Freedom of Panorama! With that, the primary goal seems accomplished,” #SaveFOP petition creator Trinkhaus told euronews by email in reaction to the Commission’s statements. But merely shooting down Paragraph 46 to preserve the status quo, guaranteeing Freedom of Panorama in the countries where it already exists, is not sufficient for the photographer. photo credit: CC BY SA Kham Tran. 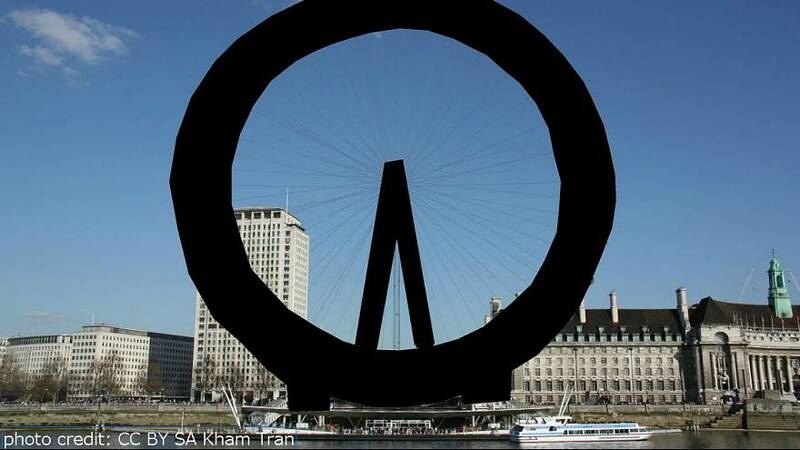 Image of the London Eye, blacked out to show the effect of removing Freedom of Panorama legislation in the UK.